In the last six months I’ve gone from living at home with my parents to living with my own family. I work quite long hours, have an 11 year old step-daughter, who goes in and out of vegetarian phases and requires good nutritionally balanced food to support all the things that growing up involves, and a partner who switches between 12 hour day and night shifts every few weeks. Needless to say our schedule is hectic and finding midweek meals that work for us has been a bit of a learning curve! Whenever I leave The Boyfriend in charge he seems to forget that we have limited time and will cook a casserole that takes an hour and a half in the oven on a Wednesday night and we end up eating in our pyjamas cos we’re almost ready for bed! I have a slightly different approach. 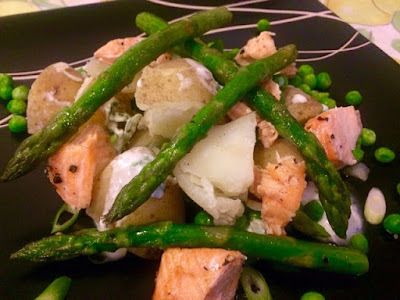 I try to switch between cooking big batch meals at the weekend, that we can heat up again or can be taken for packed lunches, or meals that are super quick to cook. The latter option involves a lot of fish. 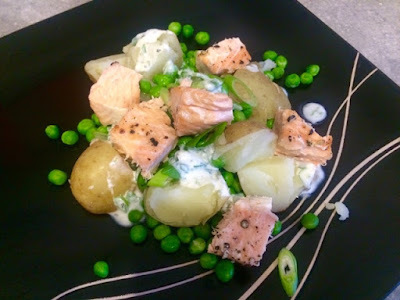 Fish is one of my favourite midweek options, it’s quick, it’s really good for you, very light so not too stodgy and filling, plus it’s also really really tasty. 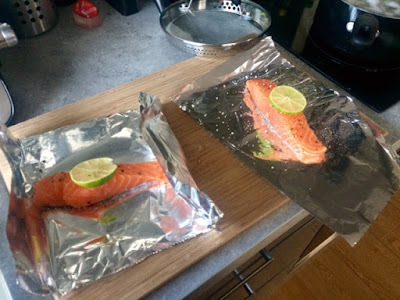 My favourite way to cook salmon is to wrap it in foil with a slice of lemon, perhaps a few herbs/spices and a bit of seasoning and then shove it in the oven for twenty minutes leaving me to get on with anything else. It comes out perfectly every time and it’s ridiculously easy. In this case this was the perfect amount of time to boil some potatoes, cook some nice green veg and prepare a simple dressing. This is a simple dinner that absolutely delivers on the flavour front and totally achievable in less than half an hour. This works very much for my schedule! 2. Put the potatoes on to boil in salted water. 3. Place each salmon fillet onto a square of foil, season with salt and pepper and top with slice of lemon/lime. Fold foil up around each fillet and scrunch to seal. 4. Place on a baking sheet and cook in the oven for 20 minutes. 5. 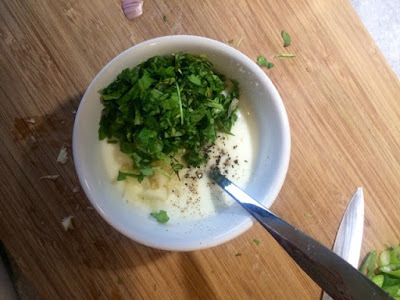 Mix together all the ingredients for the dressing in a pot, taste and adjust seasoning accordingly. 6. 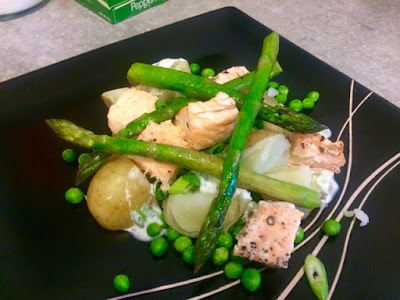 Heat a little oil in a frying pan and gently cook the asparagus until slightly softened and with a little colour. 7. 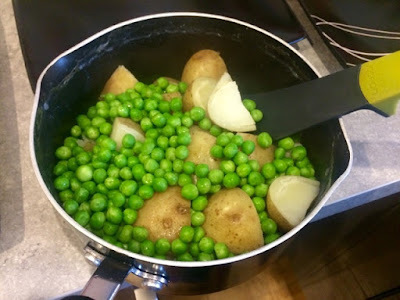 When the potatoes are nearly ready throw in the frozen peas. Drain when cooked. 8. 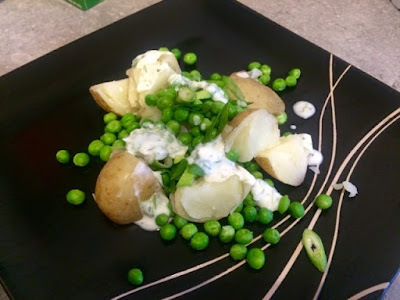 Plate up the peas and potatoes, scatter over some spring onion and drizzle with a tbsp of the yoghurt dressing. Serve the rest of the dressing in a pot on the table for people to help themselves. 9. Remove the fish from the oven, unwrap the parcels and flake into chunks. Add to the plate.